You'll be £20.00 closer to your next £10.00 credit when you purchase Yank and Rebel Rangers. What's this? The American internal war of 1861-65 was not civil. Those fighting for the Union called it the “War of the Rebellion” while the Confederacy viewed it as the “War of Yankee Aggression” or the “Second War of Independence”. 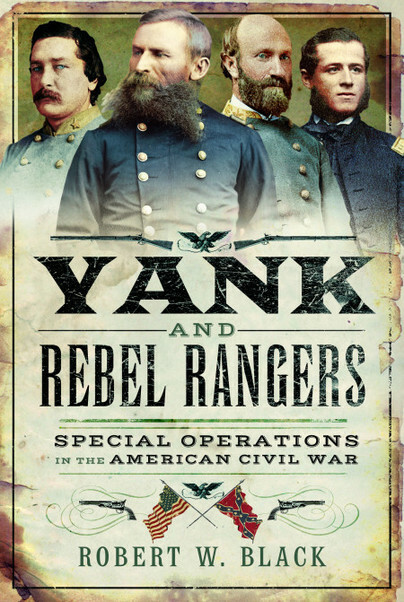 Armies fought great, sweeping battles over vast distances and are well recorded – Antietam, Shiloh, Fredericksburg, Gettysburg - but in the seams of the battlefield another, and much less known or publicized war raged. Both the Union and the Confederacy employed small forces of bold and highly motivated soldiers for special operations behind enemy lines. Skilled in infiltration – sometimes disguising themselves as rural mail carriers - these warriors deftly scouted deep into enemy territory, captured important personnel, disrupted lines of communication and logistics, and sowed confusion and fear. Often wearing the uniform of the enemy, they faced execution as spies if captured. Despite these risks, and in part because of them, these warriors fought and died as American rangers. Colonel Robert W. Black is a decorated US Army Ranger who fought in the Korean and Vietnam Wars. Originally assigned to the 82nd Airborne, Black volunteered for the 8th Airborne Ranger Company and served as a Browning Automatic Rifle gunner in Korea. In 1966 he was assigned to Military Advisory Command, Vietnam (MACV). Together with his Korean War experience Colonel Black saw combat actions in eight campaigns. Twice awarded the Combat Infantryman Badge, he holds the Silver Star, three Bronze Stars (two for valor), the Legion of Merit, the Air Medal, the Joint Service Commendation Medal, two Army Commendation Medals, the Vietnam Cross of Gallantry, and the Vietnam Cross of Honor.